Home » Academics » Schools » School of Science, Engineering and Technology » Faculty » Anna Lurie, Ph.D.
Anna Lurie, Ph.D., has been working for St. Mary’s University since 2002. She is passionate about making mathematics and statistics less intimidating and more enjoyable for her students. Lurie’s current research interest is statistics for education, but she is particularly interested in improving student assessment and retention. Together with other Mathematics faculty members, Lurie helped develop an actuarial concentration for Mathematics majors at St. Mary’s. This concentration is a combined mathematics and business degree with applications in insurance. In order to become an actuary, one must take certification exams, so Lurie teaches a preparatory course called Theory of Interest, which prepares students to take Exam FM (Financial Mathematics). Lurie has passed the first two certification exams, Exam P (Probability) and Exam FM. Lurie brings industry experience to the classroom. Prior to starting her career in academics, she worked as a quantitative analyst for T. Rowe Price Associates and as a statistical consultant for the Psychological Corporation. 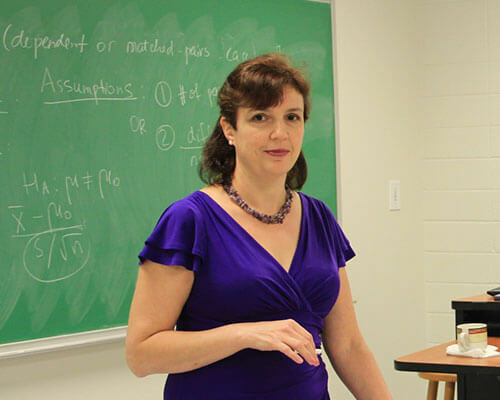 Lurie completed her studies first in the Ukraine, where she focused on mathematical physics, then in Maryland, where she concentrated on time series. Her dissertation covered change-point problems in auto-correlated data. Lurie, A., Wagner-Krankel, M. Grade Inflation in a Mathematics Classroom: An Investigation. Accepted for publication in Southwest Teaching and Learning Journal, 2013. Lurie, A., Wagner-Krankel, M. Placing students in a math course: what works best. Accepted for publication to proceedings of Research Council on Mathematics Learning Conference, 2014.